Our supplement is formulated from a strain of probiotics - living microorganisms which, when consumed in adequate amounts, offer benefits for our health. Found in many parts of the body, probiotics are best-known for forming gut flora, also known as intestinal microbiota. Widely-studied in recent years, gut flora plays a key role in digestion and immune system function. While there are many probiotic strains, our supplement is specially formulated from the strain Lactobacillus gasseri which is known to be naturally present in breast milk and which is a valuable aid to maintaining the balance of gut flora. Recent studies also suggest it can support weight control, by helping to reduce waist circumference. optimising the body’s natural immune defences. 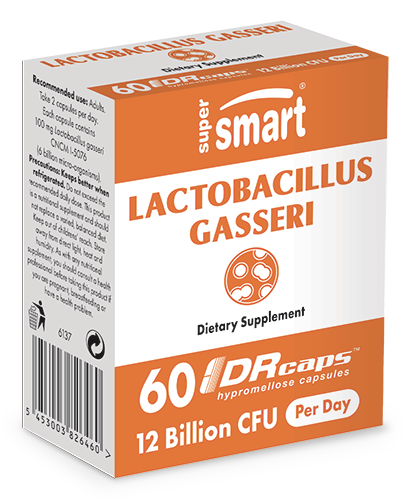 Indeed Lactobacillus gasseri represents a major new addition in a field where there is considerable cross-over between genetic and metabolic causes, low metabolic energy, cardiovascular disease and type 2 diabetes. A number of studies report that consumption of Lactobacillus gasseri promotes a reduction in abdominal adipose fat. A 12-week, double-blind Japanese study of 210 adults with abdominal adiposity clearly showed that Lactobacillus gasseri reduced BMI (Body Mass Index), waist and hip circumference, and abdominal fat mass by 8.5% in comparison with a control group where no such parameter changes were noted. However, the researchers also found that regular ingestion is necessary for such effects to endure. Research published in the journal Nature had already indicated that microbial populations in the gut are different between lean and obese people and that when obese people lose weight, the composition of their microflora reverts back to that of individuals with a normal BMI, thus suggesting obesity may have a microbial component. Sub-cutaneous adipocytes are the major source of leptin and adiponectin. Leptin is an adipocyte hormone which controls weight by regulating food intake and energy output. Leptin concentration is closely linked with body fat percentage and higher serum levels are always found in obese individuals. According to this study, administration of L. gasseri suppressed increases in plasma leptin, suggesting that a reduction in weight and fat mass is associated with a decrease in serum leptin. Similar effects had already been observed in earlier studies. Our lactobacillus gasseri product comes in DR Caps™, capitalising on the latest advances in delivery systems in order to fully deliver the benefits of this probiotic strain. These gastro-resistant capsules protect the probiotics from the effects of stomach acids, optimising their supply to the body. The suggested dose is two capsules a day, equivalent to a daily intake of 6 billion micro-organisms. This can also be boosted by taking prebiotics such as fructooligosaccharides which promote the growth of probiotics in gut flora. Along with Lactobacillus gasseri, you may also be interested in other bacteria which offer protective effects including the patented strain Bacillus subtilis, recognised for its immune-stimulant properties, and the strain Lactobacillus reuteri, recommended for problems such as diarrhoea. Other ingredients : Acacia gum, rice bran.